The Guatemalan Pygmy Owl is a small owl with no ear-tufts. A red and a brown morph exist, with the red being more common. Typical call - Monte Uyuca Biological Reserve, Honduras. March 2012. CC John van Dort. Description: Red morph: The facial disc is pale rufous-buff with darker rufous streaks from the eyes to the indistinct border of the disc. Eyebrows, chin and lores are whitish. Cere is dirty pale yellow and the bill is yellowish-horn. Eyes are yellow. There is a buffish-rufous band across the throat. The crown, front, sides of the head and nape are bright rufous or chestnut, with subdued paler spots. There is a buffish collar around the back of the neck, and blackish 'false eye' spots, bordered buffish white. The back and mantle are bright rufous, or pale chestnut, with indistinct darker and paler markings. Scapulars have slightly paler rufous edges. Wings are bright rufous, banded with narrow, paler, but dark-edged bars. The tail is rufous-brown with 5-8 bars of buffish spots, finely edged blackish or dark brown. The centre of the underparts from the neck to the belly is whitish. The sides of the breast and flanks are cinnamon-buff or rufous, while closer to the centre of the underparts is whitish with broad, diffuse rufous streaks. Tarsi are feathered to the base of the toes, which are bristled and coloured dirty yellow with yellow soles. Claws are dark horn with blackish tips. Brown morph: Plumage patterns are similar to the red morph, but general coloration is brown to dark brown, and the pale markings are whiter. Size: Length 16-18cm. Wing length 82-98mm. Tail length about 65mm. Habits: This owl is partly diurnal. Voice: The song of the male is a long, regular series of two whistled notes with emphasis on the second note, which is slightly higher in pitch - pupuhp-pupuhp-pupuhp-pupuhp-pupuhp-pupuhp. 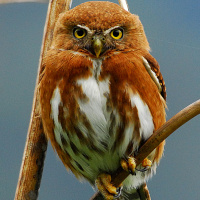 Hunting & Food: The Guatemalan Pygmy Owl feeds mainly on insects and other arthropods, as well as small vertebrates. Breeding: Breeding biology little known. Nests in woodpecker holes in trees. Lays 3-4 white eggs. Habitat: Forested mountainous regions, normally at higher altitudes. 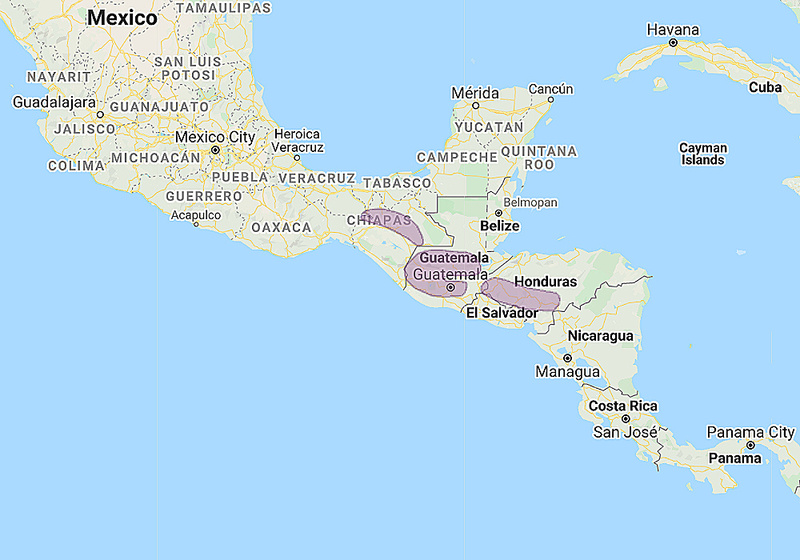 Distribution: Southern Mexico to Guatemala and Honduras. Original Description: Sharpe, Richard Bowdler. 1875. Ibis, 3rd Series, vol. 5, p. 260. See also: Other owls from North America, Central America, Genus: Glaucidium. Page by Deane Lewis. Last updated 2015-11-19.